The DS3, which competes with BMW's Mini models, logged 110,000 deliveries in 16 months to beat its original production target by almost 50 percent. PARIS -- PSA/Peugeot-Citroen is expanding the DS line of upscale cars to challenge BMW AG and Volkswagen AG's Audi with lower-priced French alternatives. PSA is ramping up production of the Citroen DS4 compact and preparing to introduce the DS5 midsized crossover by the end of the year following the success of the DS3 city car. The carmaker revived the 56-year-old DS name last year to lift the Citroen brand's profit by assembling pricier cars with the same parts and production facilities as its mass-market vehicles. The DS3, introduced in March 2010 to compete with BMW's Mini models, logged 110,000 deliveries in 16 months to beat its original production target by almost 50 percent. The recently introduced DS4 challenges Audi's A3. "The steering felt precise, and the finish quality was astonishing inside and out," said Michel Garet, 67, a Paris-based advertising consultant who traded his Audi A1 for the new Citroen model last month. "For years I stuck to German cars, then the DS4 won me over." The space-age curves and technical advances of the original DS model, including hydraulic suspension and swiveling headlamps, made it a hit among the French elite following its 1955 introduction, and a cult car in many other countries. Owners included French President Charles de Gaulle, the cosmonaut Yuri Gagarin and the actress Brigitte Bardot. PSA, aiming to recapture some of that cache, won't have an easy time beating the German carmakers at the luxury game. BMW and Audi have broader product portfolios, decades of experience and specialized sales networks for their upscale vehicles. In the size categories covered by the first trio of DS cars, Audi and BMW both currently offer about a dozen models, including variants such as convertibles and coupes. The DS line's upscale potential may also be limited by sharing the Citroen brand and showrooms with the automaker's mass-market vehicles, said Manfred Abraham, head of consulting at London-based Interbrand. He cited Volkswagen's own failure to meet a 20,000 sales target for the Phaeton luxury car, which logged about one-third of that number of deliveries last year. "Traditionally you shouldn't try to stretch a car brand like that even when it's German -- which has got to be an easier proposition on any premium market," Abraham said. "But times are changing and consumers are becoming more individualistic. The French are great at building luxury brands so maybe they can bring some of that knowledge to cars." 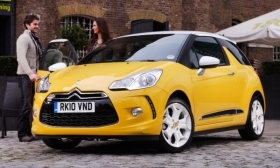 Priced slightly below the Mini and Audi A1, the DS3 is gaining ground in Europe, IHS Automotive forecasts. The DS3 starts at 15,900 euros ($22,590) in France, while the base Mini costs 15,990 euros and the A1 sells for 16,400 euros. DS3 deliveries will increase more than 30 percent this year, compared with an estimated 18 percent decline in the region for Mini models, IHS said. Deliveries of the A1, which went on sale last year, are set to quadruple. "We're taking customers from Mini, no doubt about it," Citroen managing director Frederic Banzet said in an interview. "This is new territory for us." The French carmaker also has had a share in Mini's success by supplying engines to the brand under a partnership between the manufacturers. The companies extended that cooperation last year and plan to jointly produce components for hybrid vehicles. Some 60 percent of DS3 customers are first-time Citroen buyers, and many have previously owned upscale brands, Banzet said at the carmaker's Paris headquarters. Like the Mini, Citroen's city car lets customers personalize the vehicle with a choice of mix-and-match body colors, decals and other features. PSA is making inroads where domestic rival Renault SA failed to revive a dwindling French presence in pricier vehicle categories. The conservatively styled Laguna midsize car, billed as Renault's quality flagship at its 2007 introduction, missed the annual objective of 190,000 vehicles and declined last year to half its 2008 peak of 96,000. Citroen has continued a bolder design approach for the DS line with the second model. To preserve the DS4's faux-coupe lines, the rear doors feature discreetly camouflaged handles and windows that don't open. "We know we're taking some risks," Banzet said. "The idea is that we won't be leaving anybody cold." Citroen, which owned Maserati from 1968-1975, has a history of mixing upscale sedans with more prosaic vehicles. The original DS large car, introduced with power steering, shared showroom space with the rustic 2CV. The DS cars help lift earnings because they're priced above the ordinary Citroen models with which they share about 70 percent of parts. The DS3's starting price in France is 2,600 euros more than the basic C3 model. Customers end up spending more, with one in three selecting the top "sport chic" finish, Banzet said, declining to comment on profitability. The carmaker's auto division posted a 2.4 percent operating margin for the first half. "The DS3 pricing premium is such that a low double-digit margin wouldn't be impossible to believe at the peak," said London-based Morgan Stanley analyst Stuart Pearson. "The challenge now is making that work for bigger cars, where the competition from BMW and Audi is stiffer." BMW is revamping its 1 series this year and adding Mini variants, including a coupe in the third quarter and a roadster in 2012, when Audi is also updating its A3. Citroen has booked 11,500 orders in the first two months the DS4 has been on European markets, with a full-year production target of 45,000, Banzet said. Garet, the advertising consultant who received his DS4 last month, said he has no regrets, even if the rear windows don't open. "My wife's a little claustrophobic so she didn't like it much when she rode in the back one time," he said. "But it doesn't bother me because I'm always in the driver's seat, and the car looks great."